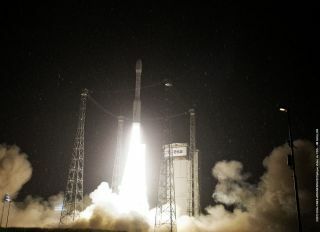 Blasting off in a tropical downpour, Europe's second Vega rocket streaked into space from the Amazon jungle on Monday, skillfully deploying three satellites on missions to map Earth's vegetation and peer down at cities, oceans and forests. The 98-foot-tall rocket lit its solid-fueled first stage motor and raced off the launch pad at the Guiana Space Center at 0206:31 GMT Tuesday (10:06:31 p.m. EDT Monday), pushing a crackling roar across the jungle spaceport as the launcher rapidly faded from view as steady rain fell on the space base. The satellites, owned by the European Space Agency, Vietnam and Estonia, were all deployed from the Vega's fourth stage within two hours of liftoff. Managers declared the launch a success. "This launch confirms the full functionality of Vega, which is totally operational and ready to offer the best service to our customers," said Stephane Israël, chairman and CEO of Arianespace, the commercial operator of the Vega rocket. It was the first launch by Arianespace since Israël took the helm of the launch firm in April, taking over for Jean-Yves Le Gall, who was the company's chief executive for more than a decade. "As you can see with this perfect success of Vega, Arianespace continues its path of successful launches on which my predecessor, Jean-Yves Le Gall, placed it for over 10 years," Israël said in a speech after the launch. "The adventure continues. This launch confirms Vega's systems a little over a year after her maiden voyage from the Guiana Space Center here last February." Le Gall is now president of CNES, the French space agency. The launch was delayed from Friday due to unfavorable high-altitude winds over the space center. For the Vega rocket, it was a crucial mission to showcase the launcher's flexibility and commercial viability on a complex flight to deploy three spacecraft in two different orbits. The lightweight booster made its successful inaugural flight in February 2012 under the oversight of ESA. Sunday's launch was the first Vega mission managed by Arianespace under contract to the European Space Agency. Four more ESA-sponsored launches are planned through 2015 to bolster the Vega rocket's credentials and put the program on a steady footing for purely commercial operations under the banner of Arianespace, the French launch services firm responsible for sales of Ariane 5, Soyuz and Vega rockets. The Vega Research, Technology and Accompaniment program, a series of five launches beginning with Sunday's mission, will lay the foundation for the lightweight launcher's commercial prospects, according to ESA officials. The European Space Agency supported the $1 billion development of the Vega rocket - primarily funded by Italy - with the goal of fielding a European-made alternative to Russian rockets for launching Europe's small scientific and Earth observation satellites. A secondary objective was to win international and commercial business. The Vega rocket, incorporating a mix of heritage and new features, flies with advanced computers and solid-fueled motors derived from the workhorse Ariane 5 rocket's solid rocket boosters. The first stage P80 motor uses an electromechanical steering system instead of hydraulic actuators - the first rocket motor of its size to use the lighter and simpler electromechanical actuators. And Vega's rocket motors are built with carbon-epoxy filament-wound motor casings, which are cheaper to produce and more reliable than traditional metal casings, according to Vega's main contractor, ELV SpA of Rome, a joint venture between the Italian space agency and Avio SpA, an Italian aerospace company. The carbon-based skin is akin to the material used in Formula 1 race cars. "They have built a beautiful product that works perfectly, provides excellent performance, and allows us to look ahead with confidence to the future," said Antonio Fabrizi, ESA's director of launchers, in remarks after the conclusion of the flight. The Vega rocket's second mission debuted a new dual-payload adapter and flight software developed in Italy to replace a French program used on the launcher's first flight. Officials reported no problems in Monday night's mission, and the rocket's Ukrainian fourth stage engine ignited a record five times to expertly place the mission's payloads into two different orbits, and then deorbit the used-up upper stage to comply with space debris guidelines. The liquid-fueled upper stage was first supposed to place ESA's Proba-V satellite in a 509-mile-high orbit with an inclination of 98.73 degrees. The rocket released the 304-pound vegetation-monitoring satellite as scheduled 55 minutes after liftoff. Two more engine burns guided the rocket into a lower 98.13-degree orbit for deployment of the mission's other two payloads: VNREDSat 1 for Vietnam and ESTCube 1 for university students in Estonia. Proba-V is embarking on a mission to continue a 15-year-old catalog of data on the state of Earth's vegetation and land cover. It is bridging a gap in satellite coverage from the retirement of France's Spot 5 satellite and the launch of the European Commission's first Sentinel 3 satellite, which will take over vegetation monitoring in about 2015. Engineers confirmed Tuesday morning the acquisition of the first radio signals from Proba-V, verifying the spacecraft was alive after launch. "The complete success must be confirmed by the commissioning of the satellite, but already now we can say the satellite is in good shape in a perfect orbit, and I think it will have a brilliant future," Fabrizi said. Built by QinetiQ Space in Belgium, the Proba-V spacecraft is about the size of a kitchen oven, but engineers stuffed the satellite with five technology payloads and a miniaturized vegetation instrument to supply researchers with information on plant growth. Proba-V's main sensor, designed with eyes to see in visible and infrared light, comprises an array of three telescopes and detectors. Although smaller than the preceding instruments on the Spot satellites, Proba-V's camera is more than twice as sensitive, with a peak resolution of 100 meters, or about 328 feet. Each scan from the satellite's instrument covers a swath of Earth about 1,400 miles wide, giving context to scientists studying crop yields, wildfires and water shortages. The spacecraft flies in an orbit allowing it cover the whole planet in two days. The $65 million mission is led by Belgium, which provided most of the project's funding, built the spacecraft and vegetation instrument, and is home to the mission control center in Redu. After six months of commissioning, officials plan to declare Proba-V operational and transfer responsibility from ESA's technical directorate to the Earth observation division, opening the mission's data chain to thousands of users. The Vega rocket's other main passenger, the sharp-eyed VNREDSat 1 Earth observation satellite, is starting a five-year mission to survey the planet with a high-resolution optical camera for the Vietnamese government. Astrium Satellites built the 254-pound spacecraft in an agreement with the Vietnam Academy of Science and Technology. Funded mostly by overseas direct assistance from the French government, VNREDSat 1 is Vietnam's first Earth observation satellite. Vietnam will use the spacecraft to better respond to natural disasters, manage the development of natural resources, and observe the effects of climate change, according to the VAST website. The satellite's camera has a resolution of 2.5 meters, or 8.2 feet - capable enough to see cars and trucks from orbit more than 400 miles above Earth. The final satellite deployed by the Vega rocket was ESTCube 1, Estonia's first satellite. The tiny CubeSat, built by a student consortium led by the University of Tartu, will extend a 32-foot tether in orbit to demonstrate a novel propulsion method called the electric solar sail. If employed by larger satellites, the electric solar sail concept would be able to naturally remove spacecraft from orbit or accelerate probes to high velocities into deep space. Conceived by scientists in Finland, the idea works by unfurling electrified wires from a satellite to interact with charged particles streaming away from the sun in the solar wind. Scientists say the interaction between the spidery wires and space plasma would produce a gentle force to gradually propel a spacecraft. ESTCube 1's goal is to prove the electric solar sail concept is valid. A follow-up mission in development by Finnish students will launch next year with an experiment to further test the electric sail's ability to deorbit a satellite. Four more Vega demonstration launches are scheduled under the banner of ESA's research and development program, but the next mission of the small-class launcher - scheduled for next year - is a commercial flight set to loft the DZZ-HR observation satellite for Kazakhstan. Another Vega launch in 2014 will loft ESA's Intermediate Experimental Vehicle, a suborbital lifting body re-entry demonstrator, officials said. Laurent said Arianespace believes it is feasible to launch up to three Vega rockets per year, serving European government, international and commercial customers. At such a flight rate, Vega missions could be sold for between $46 million and $59 million per launch, Laurent said in a media briefing before Monday's launch.